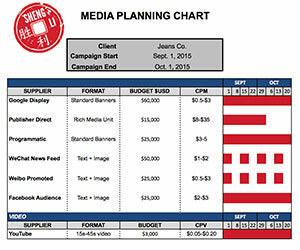 WHY CHOOSE SHENG LI TO MANAGE YOUR MEDIA BUYING? Cultural Understanding: The digital media landscape is uniquely complex in the Chinese market. We’ll showcase your message using the right language, tone, and calls to action. Platform Navigation: In different regions, there are various local media channels you don’t want to miss out on. We do the research to fine-tune and design the best Chinese media buying campaigns for your business. Audience Targeting: We fine-tune ads for granular demographic targeting to ensure they reach the right people at the right time. It’s better to ask us what we don’t do in the Chinese digital media buying space. We provide the best in Chinese display advertising and online media buying including RTB, programmatic, retargeting, video ads, and much more. We have access to the biggest ad exchanges in China, such as Tanx ADX, Tencent Ad Exchange, and DoubleClick Ad Exchange. We also have access to WeChat advertising. We’ll choose the most efficient media channels for positioning your brand and maximizing your presence in the Chinese market, while taking care of all campaign planning and buying. Direct online media buying with individual publishers will be facilitated, along with social influencer outreach campaigns and contesting. Sheng Li handles all of the creative development in-house — text ads, banner and video creative design, analytics integration, translation, and the development of landing pages or microsites. While our primary focus is in digital advertising, we have many partners that can assist with TV, print, radio, and outdoor campaigns. If you are looking for a one-stop shop, then we can manage these partners on your behalf, so that you do not have to work with multiple vendors. On the other side of that coin, we are a young, nimble, and flexible Chinese media buying agency that is also willing to work with your vendors and any relationships that you have in place. It’s a win-win scenario for all parties.